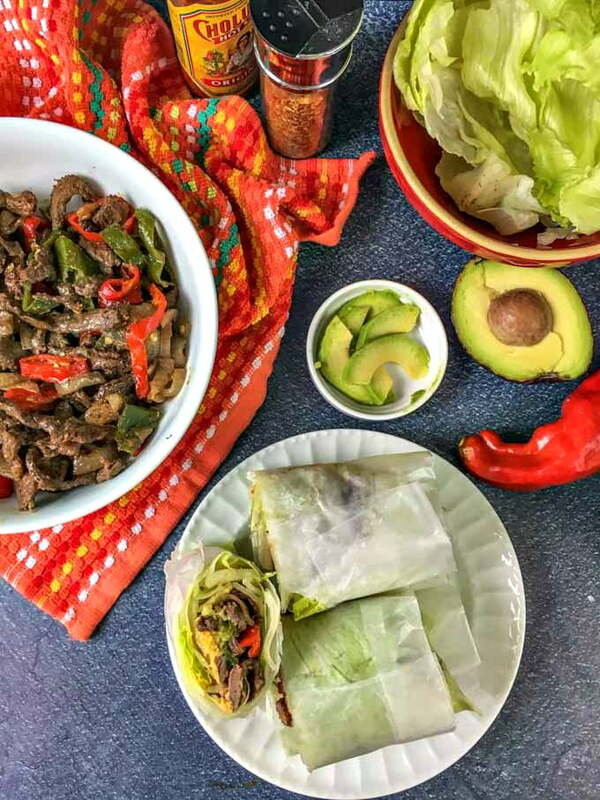 A low carb fajita burrito lettuce wrap is the perfect way to have your Mexican food on a low carb diet. 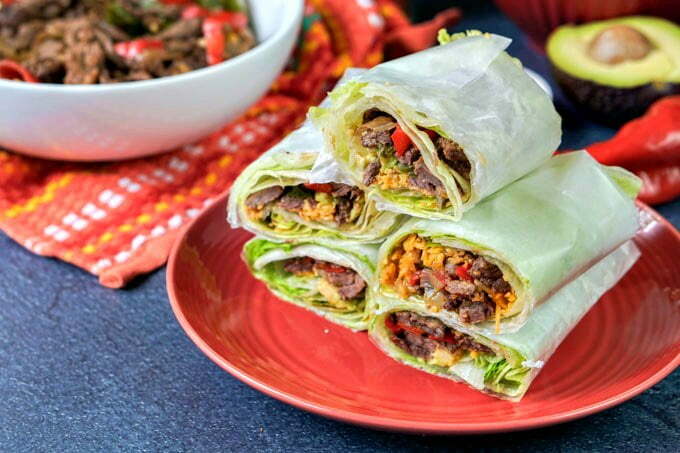 All of those Mexican flavors wrapped up in a handheld lettuce burrito! You might also like these low carb shrimp tacos with coconut tortillas. I am a big fan of lettuce cups. With a tasty filling, the lettuce makes a perfect vehicle and it’s fun to eat with your hands. 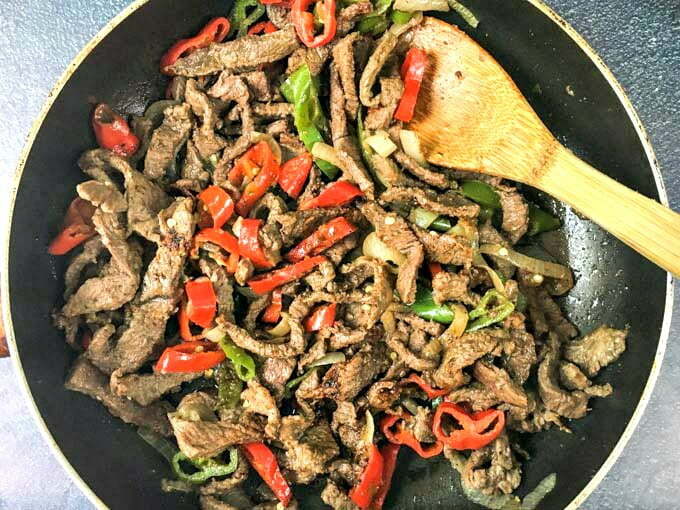 However today I have a low carb fajita burrito wrap recipe for you. 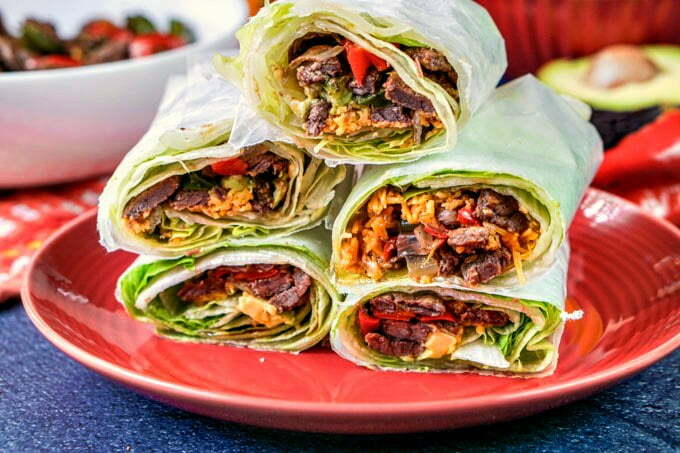 Using large layered lettuce leaves, you can roll up just about any meat filling and hold it in your hand as you would a traditional wrap. 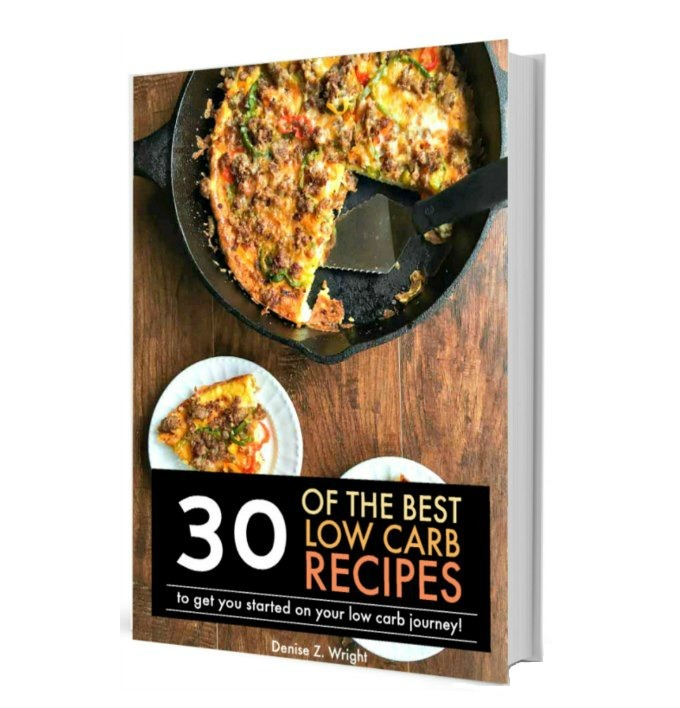 It’s a refreshing low carb alternative to flour tortillas. 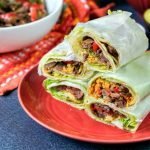 Each wrap has only 5.5g net carbs. Take any kind of beef you want or even chicken. I found some thin sliced sirloin beef steaks at Aldi. They were a little tough but the marinade helps tenderize it. You want to cut the meat up into thin strips though, to make it easier to eat. Whisk the marinade of oil, lime juice, garlic, salt, cumin and oregano. Add both the meat and the marinade to a zipper bag and store in the refrigerator over night. To make the filling, add a little oil to a large saute pan and heat to medium high. Add the meat mixture along with the vegetables, salt and chili powder. Turn the heat down to medium and cook until the meat is browned and the vegetables and soft – about 10 – 15 minutes. Take the meat off the stove and let cool a bit. I found out how to do this on Lexi’s Clean Kitchen. Check out her video to see how she does it. I put a piece of tape to keep the wax paper closed and cut in the middle. It’s easier than it looks and Lexi does an excellent job so check out her video. 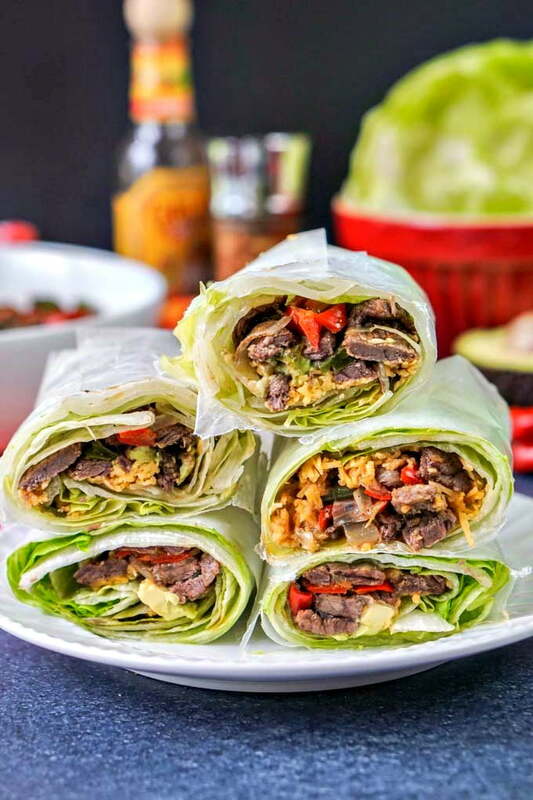 A low carb fajita burrito lettuce wrap is the perfect way to have your Mexican food on a low carb diet. All of those Mexican flavors wrapped up for a handheld lettuce burrito! The night before, mix the marinade and add with the meat to a large zipper bag. Make sure all the meat is covered with the marinade. The next day, add the oil to a large saute pan and heat up to medium high. Add the meat mixture as well as the salt and chili powder. Cook for about 10 minutes until the meat is browned. 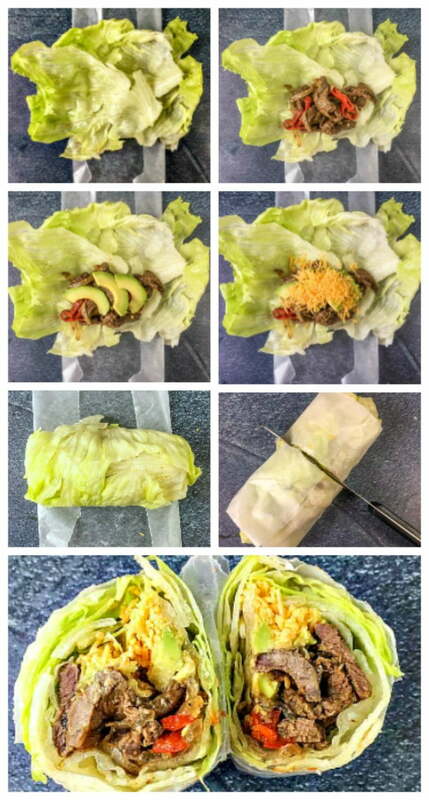 Cut a piece of wax paper the same width as the lettuce wrap and roll up your lettuce burrito. Cut in half and eat! This recipe makes at least 6 burritos. However they taste better eaten right away as the lettuce get a bit soggy the next day. So you might want to adapt the recipe to you liking. Previous Post: « Low Carb Meatball Sub Cups – Try for your next football party!